Why is this duck dominating social media? Celebrity spotters in New York City, have a new star in their sights: A multi-coloured duck. The male mandarin duck - Aix galericulata - has found fame in the Big Apple after he appeared in Central Park. His colourful plumage quickly earned him a keen following on social media. It all started on 10 October, when a video of the colourful bird was shared on Twitter by Manhattan Bird Alert.The city's bird-watching community rushed to catch a glimpse of the mysterious visitor. The species is native to east Asia, and many speculated it has escaped from a "private owner". The account suggested the arrival had dethroned the wood duck as the "prettiest duck in the park". 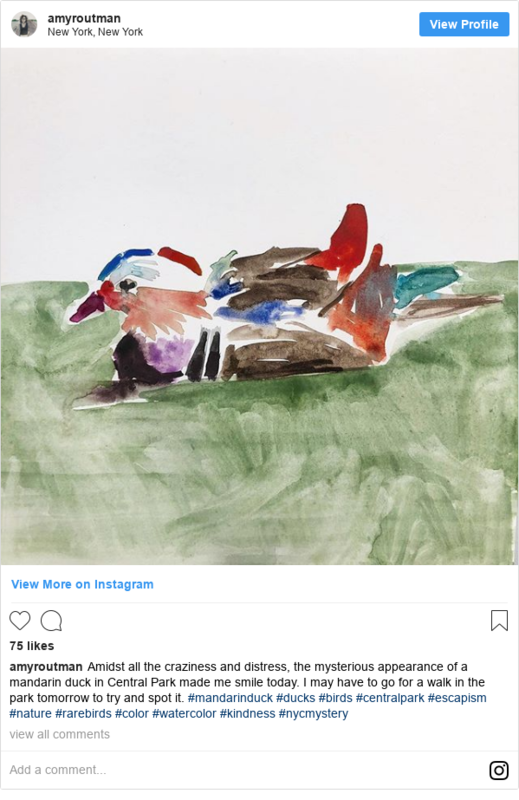 The duck's vibrant appearance is perhaps the perfect Instagram fodder, and may go some way to explain his rapid rise to social media stardom. The platform has since seen 19,200 posts using the hashtag #MandarinDuck.Also, the bird is hardly inconspicuous, with his purple and blue mohawk, pink bill and orange 'sail' feathers. Instagram user @pjmdvm, a microbiologist and veterinarian, said she had "stalked a lot of birds, and he was one of the easiest to find". Marisa Cespedes shared a video of the assembled press and bird-watchers clamouring to get the perfect shot of Central Park's new "rock star". Holly Mascaro, a New York based bird watcher, described the duck as "the hottest bachelor in NYC", and wrote that he was "trying to fit in with the mallards". Speculation over where the duck came from has been rife, given that this breed of duck is native to east Asia. Many on Twitter highlighted a small tag on the duck's leg, and asked if he had escaped from the local zoo. Central Park Zoo, who do have a mandarin duck, confirmed the one currently making a splash in the park does not belong to them. Manhattan Bird Alert suggested that the bird may have escaped from a "private owner".To the consternation of Friends fans everywhere, it is illegal to keep a duck as a pet in New York City. The NYC Department of Park and Recreation shared a video of the city's "hottest celebrity" to welcome him to the park. And the bird's arrival has inspired some social media users to create artistic tributes to the eye-catching animal.